"Muscle Shoals" redirects here. For other uses, see Muscle Shoals (disambiguation). 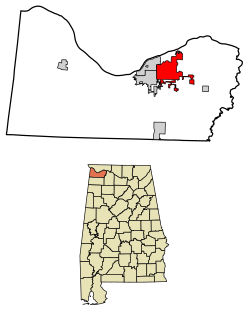 Muscle Shoals is the largest city in Colbert County, Alabama, United States. As of the 2010 census, the population of Muscle Shoals was 13,146. The estimated population in 2015 was 13,706. Both the city and the Florence-Muscle Shoals Metropolitan Area (including four cities in Colbert and Lauderdale counties) are commonly called "the Shoals". Northwest Alabama Regional Airport serves the Shoals region, located in the northwest section of the state. Since the 1960s, the city has been known for music – developing the "Muscle Shoals Sound", as local recording studios (including FAME Studios in the late 1950s and Muscle Shoals Sound Studio in 1969) produced hit records that shaped the history of popular music. Due to its strategic location along the Tennessee River, Muscle Shoals played a key role in historic land disputes between Native Americans and Anglo-American settlers in the late 18th century and early 19th century. Muscle Shoals was the site of an attempted community development project by Henry Ford in 1922. The original streets of Muscle Shoals were named after streets in Detroit, Michigan due to Henry Ford's influence in the area. Just like Detroit, Woodward Avenue is the name of the main road through the city. Henry Ford's inability to acquire land from the Tennessee Valley Authority foiled his desire to create a 75-mile industrial megalopolis from Decatur to the tri-state border of Pickwick Lake. The Ford Motor Company operated a plant in the Listerhill community, three miles east of Muscle Shoals, for many years before closing in 1982. There are several explanations on how the city got its name. One is that the city gets its name from a former natural feature of the Tennessee River, namely Muscle Shoals, a shallow zone where mussels were gathered. When the area was first settled, the distinct spelling "mussel" to refer to a shellfish had not yet been fully adopted. The city is one of four municipalities known as the Quad Cities, the others being Florence, Sheffield and Tuscumbia, all in Alabama. Muscle Shoals was a part of the Cherokee hunting grounds dating to at least the early eighteenth century, if not earlier. After the American Revolution, Cherokee attitudes toward the new U.S. republic were divided. An anti-American faction, dubbed the Chickamauga, separated from more conciliatory Cherokees, and moved into present-day south-central and southeastern Tennessee, most of them settling along the Chickamauga River. They claimed Muscle Shoals as part of their domain, and when Anglo-Americans attempted to settle the region in the 1780s and 1790s, the Chickamaugas bitterly resisted them. Upper Creeks, residing in what is now north and central Alabama, also resented any European or Euro-American presence in the region. A major incident occurred in 1790, when U.S. President George Washington sent an expedition under Major John Doughty in an attempt to establish a fort and trading post at Muscle Shoals. This expedition was nearly annihilated by a Chickamauga and Creek party sent to destroy it, and the project was abandoned by Doughty and the administration. Anglo-American settlers in Tennessee continued to agitate for control of the region. The site was particularly desirable, as it controlled access to fine cotton-producing land immediately to its south. In 1797, John Sevier, the first governor of Tennessee, complained to Andrew Jackson that "The prevention of a settlement at or near the Muscle Shoals is a manifest injury done the whole western country." At Sevier's behest, Jackson attempted to persuade Congress and President John Adams to fund a new expedition to take control of the site, but to no avail. U.S. officials finally took control of the region in the wake of the U.S. invasion of Creek country during the War of 1812. Jackson and General John Coffee obtained cession of the land from both the Cherokee and Creek (who had continued to dispute possession) by treaty, without permission from the federal government. Secretary of War William H. Crawford refused to recognize the cession, and reconfirmed Cherokee ownership, leading to personal enmity between him and Jackson, and causing a political struggle over the lands which Jackson and his backers eventually won. When Jackson, as President, implemented the policy of Indian Removal, Muscle Shoals was used as a site from which to exile Upper Creeks to Oklahoma Indian Territory. During World War I President Wilson authorized a dam just downstream of Muscle Shoals to help power nitrate plants for munitions. The first plant started producing nitrates two weeks after the armistice, but the dam was not completed until 1924. Meanwhile, in 1922 Henry Ford tried to buy the nitrate works and the unfinished dam. The car manufacturer and industrialist proposed leasing the uncompleted hydro-electric dam at Muscle Shoals on the Tennessee River in Alabama. The US War Department had begun the project during World War I, and engineers estimated a cost of $40 million to complete. At this time, public projects were financed either through raising taxes—which, Congress was unwilling to do at the time, or by issuing bonds. For the Muscle Shoals project, the proposal was for 30-year bonds at 4% interest. Ford, as well as his friend and fellow inventor Thomas Edison, balked at the idea that the US government should have to pay $48 million in interest on top of the $40 million they would have to pay back—all for a project that would benefit the public (the argument being that the hydro-electric dam and accompanying fertilizer plants would create jobs and revitalize the area). Responding to the bond issue, Edison remarked: “Any time we wish to add to the national wealth, we are compelled to add to the national debt.” Edison and Ford hoped that a new monetary system could be created where dollar bills were issued directly to workers and manufacturer, with the money being backed by the goods they produced rather than the gold and silver held in bank vaults. Congress eventually rejected Ford's idea. The project languished until the Franklin D. Roosevelt administration created the Tennessee Valley Authority in 1933. Muscle Shoals hosted the recording of many hit songs from the 1960s to today at two studios: FAME Studios, founded by Rick Hall, where Arthur Alexander, Percy Sledge, Aretha Franklin, Wilson Pickett, Otis Redding and numerous others recorded; and Muscle Shoals Sound Studio, founded by the musicians known as The Swampers, which developed work for Bob Dylan, Paul Simon, the Rolling Stones and others. All four of the Quad Cities have contributed to the "Muscle Shoals Sound". In addition to being home to country music band Shenandoah, a number of artists have visited Muscle Shoals to write and record. Both FAME Studios and Muscle Shoals Sound Studio are still in operation in the city. While famous for classic recordings from Rod Stewart, Aretha Franklin, Eric Clapton, Lynyrd Skynyrd, the Rolling Stones, and The Allman Brothers, recent hit songs such as "Before He Cheats" by Carrie Underwood and "I Loved Her First" by Heartland continue the city's musical legacy. George Michael recorded an early, unreleased version of "Careless Whisper" with Jerry Wexler in Muscle Shoals in 1983. Bettye Lavette recorded her Grammy nominated album "Scene of the Crime" at FAME in 1972. Fans of Muscle Shoals music visit the local landmarks. While most of the city's recording studios are still active, the majority will allow tours with an appointment. A number of rock, R&B and country music celebrities have homes in the area surrounding Muscle Shoals (Tuscumbia), or riverside estates along the Tennessee River, and often perform in area nightclubs, typically rehearsing new material. Muscle Shoals encouraged the cross-pollination of musical styles. Black artists from the area such as Arthur Alexander and James Carr used white country music styles in their work, and white artists from the Shoals frequently borrowed from the blues/gospel influences of their black contemporaries, creating a distinct sound. Sam Phillips, founder of Sun Records, lived in the area and stated in his autobiography that Muscle Shoals radio station WLAY (AM), which had both "white" and "black" music on its playlist, influenced his merging of these sounds at Sun Records with Elvis Presley, Jerry Lee Lewis and Johnny Cash. Rolling Stone editor David Fricke wrote that if one wanted to play a single recording that would "epitomize and encapsulate the famed Muscle Shoals Sound", that record would be "I'll Take You There" by The Staple Singers in 1972. After hearing that song, American songwriter Paul Simon phoned his manager and asked him to arrange a recording session with the musicians who had performed it. Simon was surprised to learn that he would have to travel to Muscle Shoals to work with the artists. After arriving in the small town, he was introduced to the Muscle Shoals Rhythm Section ("The Swampers") who had recorded this song with Mavis Staples. Expecting black musicians (the original Rhythm Section consisted only of white musicians), and assuming that he had been introduced to the office staff, Simon politely asked to "meet the band". Once things were sorted out, Simon recorded a number of tracks with the group, including "Loves Me Like a Rock", "Kodachrome" and "Still Crazy After All These Years" in 1973. When Bob Dylan told his record label that he intended to record Christian music, the initially dismayed label executives insisted that if he planned to pursue the project, he must, at least, record the work in Muscle Shoals, as they felt it would provide the work "some much-needed credibility". Dylan had not previously had an overtly religious attitude, and some were worried that his efforts would be taken as satirical. Recording in the Bible Belt, it was thought, might avert a disaster. Dylan subsequently recorded two Christian albums at Muscle Shoals Sound Studios, Slow Train Coming (1979) and Saved (1980). More recently, Florence native Patterson Hood, son of "Swamper" David Hood, found fame in his own right as a member of the alternative rock group Drive-By Truckers. The top two finishing finalists on the 2007 season of country-music singing competition Nashville Star, siblings Zac Hacker (second place) and Angela Hacker (winner), are from Muscle Shoals. In 2008, State Line Mob, a Southern rock duo group formed by singer and songwriters Phillip Crunk (Florence native) and Dana Crunk (Rogersville native), released their first CD, Ruckus, and won two Muscle Shoals Music Awards for 2008 for (Best New Artist) and Best New Country Album) of the year. Band of Horses recorded a portion of their massive hit album "Infinite Arms" at Muscle Shoals. Artists which are signed to the label in 2017 are: Holli Mosley, Dylan LeBlanc, Jason Isbell, Angela Hacker, Gary Nichols, and James LeBlanc. Although Muscle Shoals has lost its 1960s and 1970s status as "Hit Recording Capital of the World" (as a sign near the airport once read), there is a group of young, local musicians that are making waves again in the musical world. These include Drive-By Truckers, The Civil Wars, Dylan LeBlanc, Gary Nichols, Jason Isbell, State Line Mob, Eric "Red Mouth" Gebhardt, Fiddleworms, and BoomBox. The original Muscle Shoals Sound Studios were located at 3614 Jackson Highway in Sheffield but that site was closed in 1979 when the studio relocated to 1000 Alabama Avenue in Sheffield. The studio in the Alabama Avenue building closed in 2005 and as of 2018[update] houses a movie production company which hosts tours and concerts at the venue. Muscle Shoals is where The Black Keys filmed their music video for "Lonely Boy". It was recorded just outside a motel, and stars a security guard named Derrick T. Tuggle, who is dancing and lip-syncing the song. He says he knew the band personally, and had a BBQ restaurant across the street from their recording studio. Sister city Florence, Alabama, is frequently referred to as "the birthplace of the Blues". W. C. Handy was born in Florence and is generally regarded as the "Father of the Blues". Every year since 1982, the W. C. Handy Music Festival is held in the Florence/Sheffield/Muscle Shoals area, featuring blues, jazz, country, gospel, rock music and R&B. The roster of jazz musicians known as the "Festival All-Stars", or as the W. C. Handy Jazz All-Stars, includes musicians from all over the United States, such as guitarist Mundell Lowe, drummer Bill Goodwin, pianist/vocalist Johnny O'Neal, vibraphone player Chuck Redd, pianist/vocalist Ray Reach, and flutist Holly Hofmann. On January 6, 2010, Muscle Shoals was added to the Mississippi Blues Trail. After FAME studio founder Rick Hall died in early 2018, The New Yorker concluded its retrospective with this comment: "Muscle Shoals remains remarkable not just for the music made there but for its unlikeliness as an epicenter of anything; that a tiny town in a quiet corner of Alabama became a hotbed of progressive, integrated rhythm and blues still feels inexplicable. Whatever Hall conjured there—whatever he dreamt, and made real—is essential to any recounting of American ingenuity. It is a testament to a certain kind of hope." Al.com commented that Hall is survived by his family "and a Muscle Shoals music legacy like no other". An editorial in the Anniston Star concludes with this epitaph, "If the world wants to know about Alabama — a state seldom publicized for anything but college football and embarrassing politics — the late Rick Hall and his legacy are worthy models to uphold". The original location of Muscle Shoals Sound Studios in Sheffield has been listed on the National Register of Historic Places since June 2006. From the early 2000s to 2013, it had been partly restored and open for tours. In 2013, the documentary Muscle Shoals raised public interest in a major restoration of the original studio. In the same year, the Muscle Shoals Music Foundation was formed to raise funds to purchase the building and to complete major renovations. In June 2013, the owner of the property since 1999 sold it without the historic recording equipment to the Foundation. A grant from Beats Electronics, a manufacturer of headphones owned by Apple inc., and founded by Dr. Dre and Jimmy Iovine, provided an essential $1 million. The state tourism director said in 2015 that the 2013 film Muscle Shoals had been a significant influence. "The financial support from Beats is a direct result of their film." Additional donations were made by other groups and individuals. As of August 2015[update], tours were visiting the partly-restored studio on Jackson Highway. It was closed when major restoration work started in September 2015. Muscle Shoals Sound Studio reopened as a finished tourist attraction on January 9, 2017. Owned and operated by the foundation, the interior is reminiscent of the 1970s, with relevant recording equipment and paraphernalia. There are plans for future recording projects. Even before the Jackson Highway studio reopened, The Alabama Tourism Department named Muscle Shoals Sound Studio as the state's top attraction in 2017. The members of the Muscle Shoals Rhythm Section were Pete Carr (lead guitar), Jimmy Johnson (guitar), Roger Hawkins (drums), David Hood (bass guitar) and Barry Beckett (keyboards). Affectionately called The Swampers, the Muscle Shoals Rhythm Section was a local group of first-call studio musicians (initially working at FAME and then at Muscle Shoals Sound Studios) who were available for back-up. They were given the nickname The Swampers by music producer Denny Cordell during the Leon Russell sessions because of their "funky, soulful Southern 'swamp' sound". Muscle Shoals has got the Swampers. They pick me up when I'm feelin' blue. When Lynyrd Skynyrd recorded at Muscle Shoals Sound Studios once early in their career, they saw the various gold and platinum records on the walls bearing the words "To The Swampers", and later included it in the song as a tribute. Muscle Shoals is located on the south bank of the Tennessee River at 34°45′03″N 87°39′01″W﻿ / ﻿34.750788°N 87.650278°W﻿ / 34.750788; -87.650278. According to the U.S. Census Bureau, the city has a total area of 15.6 square miles (40.3 km2), of which 0.02 square miles (0.05 km2), or 0.13%, is water. As of the census of 2010, there were 13,146 people, 5,321 households, and 3,769 families residing in the city. The population density was 845.4 per square mile (326.4/km²). There were 5,653 housing units at an average density of 363.5 per square mile (140.4/km²). The racial makeup of the city was 80.6% White, 15.3% Black or African American, 0.3% Native American, 0.9% Asian, 1.3% from other races, and 1.6% Hawaiian or Pacific Islander. Hispanic or Latino of any race were 2.7% of the population. There were 5,321 households out of which 31.1% had children under the age of 18 living with them, 54.4% were married couples living together, 12.9% had a female householder with no husband present, and 29.2% were non-families. 26.2% of all households were made up of individuals and 11.3% had someone living alone who was 65 years of age or older. The average household size was 2.44 and the average family size was 2.93. In the city, the population was spread out with 23.6% under the age of 18, 8.1% from 18 to 24, 24.9% from 25 to 44, 27.3% from 45 to 64, and 16.0% who were 65 years of age or older. The median age was 40.1 years. For every 100 females, there were 90.5 males. For every 100 females age 18 and over, there were 91.9 males. The median income for a household in the city was $48,134, and the median income for a family was $60,875. Males had a median income of $41,061 versus $37,576 for females. The per capita income for the city was $23,237. About 8.3% of families and 10.6% of the population were below the poverty line, including 19.9% of those under age 18 and 4.8% of those age 65 or over. As of the census of 2000, there were 11,924 people, 4,710 households and 3,452 families residing in the city. The population density was 979.7 per square mile (378.3/km²). There were 5,010 housing units at an average density of 411.6 per square mile (158.9/km²). The racial makeup of the city was 83.88% White, 14.16% Black or African American, 0.38% Native American, 0.56% Asian, 0.31% from other races, and 0.70% from two or more races. Hispanic or Latino of any race were 1.16% of the population. There were 4,710 households out of which 34.7% had children under the age of 18 living with them, 59.4% were married couples living together, 11.3% had a female householder with no husband present, and 26.7% were non-families. 23.8% of all households were made up of individuals and 8.2% had someone living alone who was 65 years of age or older. The average household size was 2.48 and the average family size was 2.95. In the city, the population was spread out with 24.8% under the age of 18, 8.6% from 18 to 24, 29.6% from 25 to 44, 23.9% from 45 to 64, and 13.1% who were 65 years of age or older. The median age was 37 years. For every 100 females, there were 88.9 males. For every 100 females age 18 and over, there were 86.1 males. The median income for a household in the city was $40,210, and the median income for a family was $48,113. Males had a median income of $38,063 versus $21,933 for females. The per capita income for the city was $21,113. About 5.4% of families and 7.3% of the population were below the poverty line, including 8.1% of those under age 18 and 7.2% of those age 65 or over. ^ "Population Estimates". United States Census Bureau. Retrieved June 7, 2014. ^ a b "Geographic Identifiers: 2010 Demographic Profile Data (G001): Muscle Shoals city, Alabama". U.S. Census Bureau, American Factfinder. Retrieved June 6, 2014. ^ "Population estimates, July 1, 2016, (V2016)". www.census.gov. Retrieved March 10, 2017. ^ "Welcome to the Shoals!". Shoals Chamber of Commerce. Shoals Chamber of Commerce. Retrieved March 7, 2013. ^ Kaetz, James P. "Muscle Shoals". Encyclopedia of Alabama. Retrieved March 7, 2013. ^ "The Names Stayed". Calhoun Times and Gordon County News. August 29, 1990. p. 64. Retrieved April 29, 2015. ^ McGregor, Stuart W. (2002). "The mussels of Muscle Shoals". Alabama Heritage (64). ^ M. Thomas Hatley, The Dividing Paths: Cherokees and South Carolinians through the Era of Revolution (Oxford, UK: University Press, 1993), 215-228. ^ William C. McLoughlin, Cherokee Renascence in the New Republic (Princeton, NJ: University Press, 1992), 19-20. ^ William S. Coker and Thomas D. Watson, Indian Traders of the Southeastern Spanish Borderlands: Panton, Leslie & Company and John Forbes & Company, 1783-1847 (Pensacola: University of West Florida Press, 1986), 178. ^ Michael Paul Rogin, Fathers and Children: Andrew Jackson and the Subjugation of the American Indian (New York: Alfred A. Knopf, 1976), 170-174. ^ H.W. Brands, Andrew Jackson: His Life and Times (New York: Random House Digital, Inc., 2006), 93. ^ Rogin, Fathers and Children, 170. ^ Don C. East, A Historical Analysis of the Creek Indian Hillabee Towns and Personal Reflections on the Landscape and People of Clay County, Alabama. (New York: iUniverse, 2008), 106-107. ^ a b Lienhard, John H. "MUSCLE SHOALS". The Engines of Our Ingenuity. Houston, TX: University of Houston. Retrieved June 9, 2013. ^ Kazek, K. (2013).Could Muscle Shoals have been a hub rivaling Detroit? Henry Ford thought so. Alabama Living. ^ New York Times. (1921, December 5). “Ford Sees Wealth in Muscle Shoals” New York Times. ^ a b "FAME :: Our History". www.fame2.com. Retrieved March 10, 2017. ^ "FAME :: Current Artists". www.fame2.com. Retrieved March 10, 2017. ^ "Mississippi to Alabama - Muscle Shoals". msbluestrail.org. January 6, 2010. Retrieved January 31, 2010. ^ Petrusich, Amanda (January 3, 2018). "Remembering Rick Hall and the Musical Alchemy of FAME Studios". The New Yorker. Retrieved January 4, 2018. ^ "The musical secrets of FAME Studios legend Rick Hall". AL.com. January 4, 2018. Retrieved January 4, 2018. ^ "Editorial: The genius of a music legend". The Anniston Star. January 3, 2018. Retrieved January 4, 2018. ^ "The Rolling Stones and Bono Celebrate 'Muscle Shoals' - Premiere". Rolling Stone. January 15, 2013. Retrieved January 16, 2013. ^ The Associated Press (December 31, 2016). "Alabama's top tourist attraction 2017: Muscle Shoals Sound Studio". AL.com. Alabama Media Group. Retrieved January 17, 2017. ^ Corey, Russ (June 21, 2013). "Beats to renovate iconic Muscle Shoals Sound Studios". Times Daily. Florence, Alabama. Retrieved January 17, 2017. ^ "Muscle Shoals". Muscle Shoals the Movie. Ear Goggles Productions Ltd. 2012. Retrieved January 17, 2017. ^ Palmer, Robert (August 6, 2015). "Beats to renovate iconic Muscle Shoals Sound Studios". Times Daily. Florence, Alabama. Retrieved January 17, 2017. ^ The Associated Press (December 31, 2016). "Alabama's top tourist attraction 2017: Muscle Shoals Sound Studio". AL.com. Alabama Media Group. Retrieved January 17, 2016. has been revamped with a 1970s feel that includes bright colors, retro chairs and a metal ashtray; the sign over the front door is once again bright blue. Vintage recording equipment fills the production booth. ^ Scharf, Lauren (January 9, 2017). "Recording, tours resume at Muscle Shoals Sound Studio". Fox 10 TV. WALA, Mobile. Retrieved January 16, 2017. When we were closed down during renovations, people would just show up from all over the world. ^ Jay Reeves, The Associated Press (January 3, 2017). "Fabled Muscle Shoals Sound Studio named top Alabama tourist attraction of 2017". National Post. Toronto, Canada. Retrieved January 17, 2017. ^ "Muscle Shoals Rhythm Section". Alabama Music Hall of Fame. Retrieved August 7, 2016. ^ "Sweet Home Alabama by Lynyrd Skynyrd Songfacts". www.songfacts.com. Retrieved December 10, 2016. ^ United States Census Bureau. "Census of Population and Housing". Retrieved June 7, 2014. ^ "Annual Estimates of the Resident Population: April 1, 2010 to July 1, 2013". Retrieved June 7, 2014. ^ "Levi Colbert b. 1759 Muscle Shoals, Colbert County. Alabama d. 2 JUN 1834 Buzzard Roost Spring, Colbert County. Alabama: Lest Our Past Be Forgotten". Lawrence Stanley Family Genealogy. Retrieved February 5, 2013. ^ "Levi Colbert". Viki's Little Corner of the Web : A Resource for Chickasaw Native American History and Genealogy. Archived from the original on May 9, 2008. Retrieved February 5, 2013.